Water resistant, supports high resolution images up to 5760dpi. Textured linen surface with a soft gloss finish (single sided). Traditional style 'F-surface' media comprising of seven layers. Resin Coated (RC) and Micro-porous (instant drying). Super white, high brightness supporting images up to 5760dpi. Waterproof and suitable for pigment and dye inks. Produces true photographic quality images with an exceptional glossy finish. up to 5760dpi. Cast coated, suitable for dye ink only. 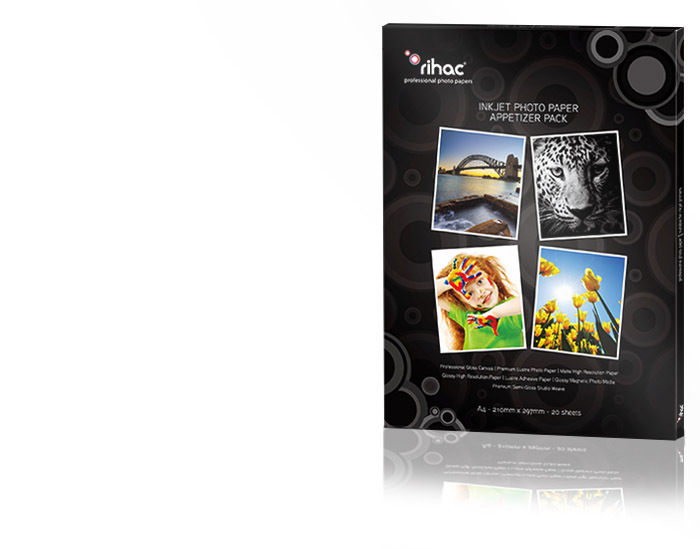 Bright, lustre photographic quality stickers with water resistant properties. Premium Semi-Gloss Studio Weave - 3 Sheets of 260gsm A4 paper Photographic studio style speciality paper with woven textured finish (E surface). Nanoporous media with two resin layers (RC) and archival qualities. the subtle soft gloss finish produces low glare levels and is suitable for Dye or pigment inks. PLEASE NOTE THAT THIS DEAL IS FOR MLEBOURNE POSTAGE ONLY. ADDITIONAL POSTAGE WILL BE REQUESTED IF POSTING OUTSIDE MELBOURNE .